Diana Rigg. Diana Rigg relaxing in a brightly colored kimono. 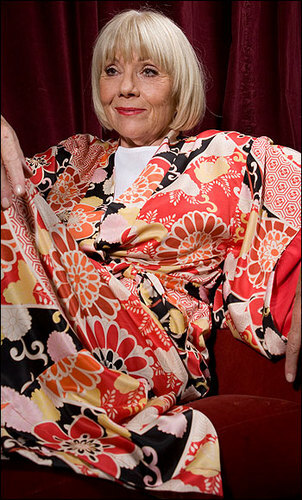 Wallpaper and background images in the Diana Rigg club tagged: diana rigg actress stage screen kimono photo. This Diana Rigg photo contains kimono. Smokin!!! Diana got it going on in this picture!! lol. Thanks for posting, Sharon. Great pic. Never seen it before until now. lol! ...love your reaction again! :D ...and glad it's new to you. I discovered this one about 1 1/2 months ago, but I'm not sure if it's something from a play, a candid pic, or how recent it is. Whatever and whenever it is...it is great. lol. Thanks again for posting it. Brings a smile to my face.